About Me, in a nut shell. 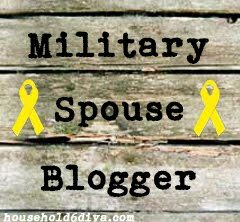 How we deal with our way of life in the military, the things we have tried while dealing with deployments and being away from family. Yippie his CCAF (Community College of the Air Force) is complete! I’m so proud of my husband! He wasn’t so excited about the dressing in his blues and putting on a gown to walk for the graduation, but I know that he holds his head high. I know that he is glad that this long chapter of his education is complete. I also know that he is going to take a few more classes so that he can get his degree. So this is just a post to let you know how proud I am of my husbands newest accomplishment! And he has already started telling the kids why he has worked so hard, and that he expects them to work as much on their education as he has! We went with my sister and her family this year to watch fireworks. The kids loved watching all the lights. I think Schyler enjoyed dancing to the view more than having a sitting view. The tree seemed to make a great partner for her! This year has been so hot in Ohio, I don’t think I ever remember it being so hot! However the 4th really was nice out! We had a great time, 3 adults 7 children, what’s not great about that! 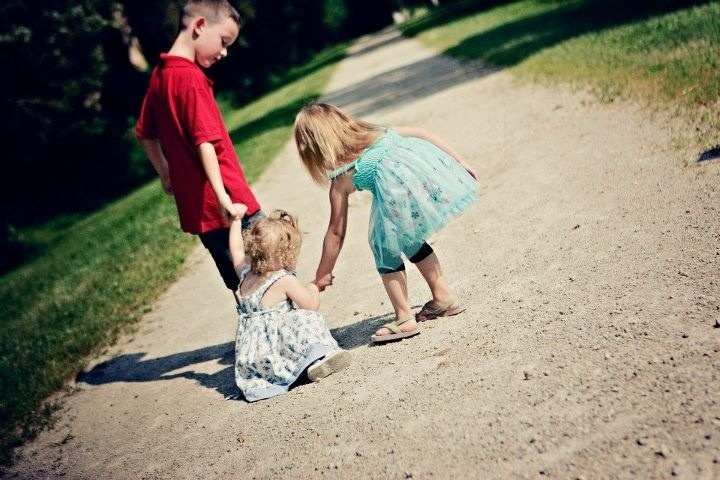 I sure hope that the kids will keep getting the chances to know one another over the years! While my mom was visiting we (her, the girls and me) made a trip to Bellagio. I honestly believe this is the first time that I have been to the Bellagio and didn’t see the fountain show. However we did make our way into the Bellagio Conservatory & Botanical Gardens. Have you ever been? 1st let me say… FAMILY FRIENDLY and then let me use the words… FREE! What could possibly keep you from visiting? I am pretty sure that if you were traveling alone or just as a couple you will still get the enjoyment from the view! Then you add the fact that they do change the Conservatory several times, so it is really nice when you go back as a local every few months. You get to see something so beautiful and breath-taking. The flowers are beautiful! My girls as you already know, love getting their pictures taken, this just puts a few extra smiles on all of our faces. Seeing all of the different beautiful colors, and varieties of flowers. The theme right now is: Spring Celebration and this will be the display until May 13, 2012. Since that is just around the corner, go for a visit and enjoy the colors, and NON desert view! According to their exhibit schedule May 21, 2012, will be the start of the Summer Garden! This was probably the best smiles we had all wk! And now…. I have SMILES OF BEAUTY… from my girls, to enjoy forever, thanks to the Conservatory & Botanical Gardens at the Bellagio! I hope you enjoy the view as much as we did! My trip to Tiffany & Co. When my mom first came to town, I asked her what all she wanted to accomplish while she was here. She told me that there was only 1 thing that she really wanted to do and that was to take me to Tiffany & Co. If you have read my past posts then you know that there is a lot of history between my mom and I. We don’t really have the best history or the best present for that matter, but I suppose that the dysfunction of our relationship will always be there. You see my mom when she does finally visit us, she brings gifts and about everything and anything imaginable for gifts for Sean and the kids. So, for me she decided that she was going to take me to Tiffany and Co.
We ended up at Las Vegas – Crystals at CityCenter, Tiffany & Co. The store is unbelievably gorgeous! And the staff is very friendly! Of course these are 2 very important factors for me! When we went to the store, my husband kept the babies out in the hallway, so that my mom and I could look around without all of the little fingers touching everything. Not that they cared in the store, in fact I was told that they have a little Tea Party set up, for when the little girls do make their visit. So, when I ever do make another stop into the store, I know I can take the babies without fretting the entire time! There were so many exquisite pieces. You see I am a jewelry fanatic, I have so many pieces I don’t even want to tell you. However, I can tell you when I did get each piece and what each of them mean to me. Most of them have some type of reasoning behind them. And now…. 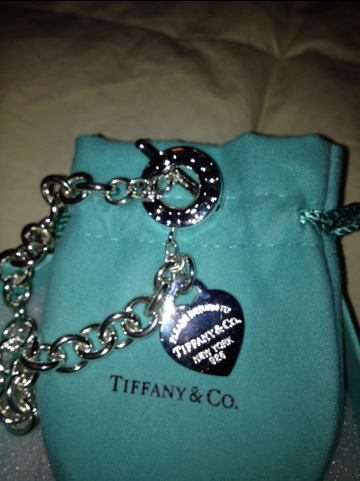 I have my first piece from Tiffany & Co. I think this piece means something a little different to me, than what it does to my mom. However I think that each time I wear it, and look at it, this is what I will remember. I will remember the year, 2012. I will remember this was the start to my mothers retirement, they year that she says that she is going to be more involved with my family. This is the year that my Papa passed away, the year that Papa was taken by God and removed of all his sufferings. This is the year that my dad is retiring also. This is the year that I actually put a voice to my moms ears about how much she has hurt me over the years. This is the MOMENT that I have accepted that I can not expect for her to want to be as large a part of my family as I want her to be. However, I think that this bracelet, might mean to her of me thinking about her each time I look at it ( I don’t think she realizes that I think of her way more often than that). The sales associates were great, and Peter, when you read this, please know that you did make for “A day to remember at Tiffany” Thank you for giving us a great journey! I think my wish list is going to start adding up. I have already decided what I want for my next piece to be!Tiffany 1837™ ring in RUBEDO™ metal. This is a special edition ring that has the signature inside of it for 2012 only, so I guess my savings account will need to learn to grow pretty quickly! With the time crunch and all! So let’s hope I get it! Do you have a dream list? I may be for Tiffany & Co. or maybe something else! Leave me a note, let’s see!!! To work or not to work, has been my question the past few days. I have thought on and off about it the last few years, but have not done anything but just contemplate! You see, unlike a lot of military spouses I had a job already lined up several months before our move here to Vegas. I was working in the insurance industry and the agent that I worked for made a few calls, and found an agent that was interested in hiring me. In turn after being mostly sold by my agent, I had to complete selling myself to the new agent over the phone. We went back and forth, and I was offered a NICE salary! When I first got to Vegas, within the first couple of days, I drove to the agent’s office to introduce myself in person. Then when I got back to where we were staying I immediately started in on trying to find daycare for our almost 3-year-old! My goodness it was outrageous the cost per month. Then on top of the price, that I of course was going to have no choice but to pay, I could NOT find anyone that had an opening for him. I called 32 providers on base alone, and then also tried calling everything daycare out of the phone book. I had NO options, everyone was full. After several wks, I had to let the agent know that I was NOT going to start work with her. I did not jump out of the blue with this, I had been giving her wkly reports, so she knew that I was having problems. A couple of months later I was in the agent’s office that we have ALL of our policies with (same company, just different agency). We spoke briefly, and he mentioned about if I was ever interested in working, he would be interested in hiring me. Then about a year later we spoke again and he mentioned it again. We actually went more in-depth about the offer, and talked about me being able to work from home. It was still just a thought at that time, and then upon investigation, I found out that I would have to take all my tests again ( I was previously licensed for… Life, Health, Property and Casualty), and it turned out that I was prego with Shyla too. That was going to be a lot of work! So I decided, I did not want to take on the obligation. Then when I got back from Ohio, and had Schyler (3 babies total now), I was in the office when we were buying this house. He talked with me again, he said I could still work from home, and to think about it. Now, many years later! I was in the office picking up the girl’s life insurance policies that I just bought, and we actually spoke more in-depth about it. He asked me if I would be interested in coming and working on selling Life Insurance. Not that I have ever written on here, but I am a FANATIC on Life Insurance. We talked about me mostly working from home again, and on my own schedule. He knows that we are military, and won’t be here for ever. So, basically I am undecided. I have been praying that God will lead me to the right direction. I’m still undecided. Good and bad these have been my thoughts. 1. Many people are searching for jobs, and this one keeps knocking, when I’m not even looking. 2. Does this job offer keep falling on me for a reason, is God telling me that it’s here and I should quit being stubborn and take it? 3. Do I really want to take the time to get licensed again? The studying and testing I spent ALOT of time on, and I didn’t even have kids yet. 5. It would be commission only, so of course the more effort I put in the more goes in my pocket. 6. I am a perfectionist when it comes to work. Will I mistakenly put work before my family? 7. At the moment both of the girls are in a program that will put them both in a 1/2 day preschool, next year. That would give me a couple of hours a day, that I would not feel bad working, and might actually enjoy having something to do. 8. I would not only be making phone calls, but I would be setting appointments to discuss the Life Insurance in person. I would have to depend on Sean taking care of the kids, and most of the time I can’t even count on him being home when I don’t have anything scheduled. If I’m going to work, I can not be cancelling appointments. 1. to see where my priority is with my family vs. work? If you have any great ideas for me to mull over, please let me know! And I should mention that he told me that there is a class for a wk, that they have you go to now (they didn’t do this when I tested before) so I would have to get someone to watch the kids. However, he did say he would pay for the class! Seriously, I really don’t understand people who have sticky fingers! If you have sticky fingers, please don’t come anywhere near me or my family. My house and my beliefs do not go along with those that live in the land of entitlement. However, somehow and in someway, someone had the intention of using their sticky fingers around my property. I had this list of things going on with my car. I needed to take it in to get it looked at, because I went to open my driver’s door to leave for school, last wk. What did I see? Another problem with my rig. The door handle looked like it was coming off, and because I have had issues with my car… I thought “great, something else coming off my car” not to mention that there was just a bit of paint under where the door handle is that was missing. Then I had a very small oil leak, that had started this wk. Now comes the part that was like… 3 item wrong definitely time to take it in, before they think I am the crazy lady making all this up with my car! The thing that made me take it in yesterday was that my dashboard had 2 places cracked. I get my car to the shop, and give my wonderful lady, my list of what is wrong with my car. So, we walk to the car, and she looks at the dash and says “that is covered under the warranty, don’t worry!”. Then I show her the door handle, she gives me this smile ( I think I have gotten to know her well, from being in there) so I thought to myself… I bet she has an idea, no way she will blame it on my critters! No, she did not blame them at all!! Better yet she begins to explain to me, that it is NOT going to be covered under the warranty, because someone had tried to break into it using a screw driver. What the heck??? Why would someone want to break into my rig? Seriously, what kind of moron are you? So she (with her finger) starts to show me exactly what they do, and is explaining the different steps that they take to keep from triggering the alarm system. Seriously people? People work pretty hard with those little sticky fingers, it takes much patience and time to work at this. If you have that much of both of those things on your schedule, YOU COULD GET PAID HUGE to work at a job! So as you can see…. some sticky fingers are in my neighborhood trying to either take my entire car, or possibly just the stereo that is in it. Either way… stop go away, and earn your own, I worked hard to buy that thing and earn it honestly! Please go do the same for yourself! Then this morning around 9am (so I’ve heard from the neighbors). Someone broke into the neighbor’s house. I don’t know if they got anything or not, but I do know that their security system is what notified the police to come to their house. Really, another land of entitlement try there! So, tonight I have spent my time looking for security systems. Do you have any suggestions? Any certain companies that you have had that you LOVE or companies that you would suggest to NOT consider? Any companies that would absolutely LOVE to give a military family a discount??!!! Either way, we are looking for a security company and would prefer to do something MUCH sooner than later! And I really think that I would like the video camera system. Again, any suggestions about companies or even options that we should consider, would be greatly appreciated! Today I did something DIFFERENT! Ok, so this may not be cool to some of you, but it was to me and mine! Looking around on my nifty NEWER, Apple IPhone 4S. I found the FaceTime, button. Ok, ok it really wasn’t that hard to find because it is on the first area that comes up. With that being said, I am one of those people that over look the features of something that is not really important to me. However, this is now going to be a great feature that I will use more often! So what I found… learned it this feature lets you not only talk, but see the person in real time. It’s pretty much the same thing as Skype… which if you look at some of my earlier posts you will see I LOVE during deployments.. A fantasic thing that I learned and was able to use on Sean’s last deployment!! First I tried it on my phone! I let the kids call my SIL, she lives in Michigan, and they haven’t seen her since she and her boyfriend came to Vegas last year for their Spring Break! So it was cool, they got to see her, and she got to chat with them face to face, this is really cool for a 2, 3 and 7 year old. I don’t know about your kids but for some reason even my 7 year old forgets that people can’t see through the phone all the cool things he wants to show off. When we were done, my mom was finaly back at her house and I talked her through hooking her phone up to the Wi-Fi. When we were all done, we were talking over the phone on the FaceTime. The kids thought it was the coolest thing ever, being able to talk and see our family at the same time. We even had the chance to talk to Mama (my grandmother). It was only on the phone, so having a 86 year old woman look at a little IPhone, was probably a bit hard, but I think she really liked seeing the kids. Then came the fun! Did I tell you that for Christmas my husband bought me an IPad 2? Holy cow, do I like that thing! I know that a lot of people say that once you have the IPhone, that the IPads really aren’t that cool, however, I can surely tell you that I only had the phone a few wks before Christmas and I absolutely LOVE them both. Anyways, back to the fun! I tried calling my mom back again on the IPad, but to my suprise!!! My sister answered, and like a dork, I was wanting to figure out how I could call my mom’s IPad. So, I had my sister call me back from it instead of mom’s phone. And since I was not smart enough to read the directions before calling, my sister informed me that I just needed to use mom’s email address! Now that is sooooo cool. So we started chating IPad to IPad and face to face!!! My sister has never been to my house, and she asked to be taken on a tour! I was kind of excited, but then as I started taking her around…. I realized how imbarrassed I really was. I truly have not cleaned my house since I got back from the funeral… not that I was being lazy, I have just been so sick, and the kids have been so sick, that I just have not hardly had the energy to do ANYTHING. I kept saying ” this is…., but don’t look it is a mess” she would just laugh and say “you are showing me and saying don’t look??! !” This was so much fun! I also got to see some throws that my mom and Mama were making. I think she said that they are making 20 to give to the nursing home that Papa was at. How awesome is that?? I am sure that all the Alzheimers and Dementia patients, will love the fact they have something warm to lay across them, and of course what person young or old doesn’t absolutely LOVE something that was just made for them? Even if they don’t remember where they got it from!!! Then Mama also got to see the kids on yet a bigger screen, much easier for her to see than the little phone screen! So, even though I have been sick for almost 5 wks now, and I can not stand being confined. I have so loved trying out something DIFFERENT and new! And Apple!!!! If you read this!!! Thank you so much for making a product, that I can use to keep my kids even closer to my family now! Being 2k miles away from family, is often heart breaking and people change so much between times that we MILITARY FOLK, get to go home. That this will surely make that time a bit less alarming when the kids see family face to face….!!!! So, again I am totally happy with my purchases, and exstatic that I got to spend FaceTime with my sister, mom, Mama and SIL!! What a great way to spend my afternoon!!! How did you spend yours? ?